The coexistence of good and evil in Nigeria cannot to any extent be underestimated. The conflict of opposites that manifest in day-to-day happenings in Nigeria illustrate that events are standing parallel to each other. Hence many attempts of the evil government and attacks on the innocent Biafrans have made it hazardous to coexist. The internal ethnic cleansing, genocide, political instability, religious tensions, Fulani herdsmen attack in many parts of Nigeria signify that it is to hit perdition. In moments, like these, one may begin to ask questions concerning the vital force or determinants that sustain them. How can two opposing elements coexist and as it appears, interact conveniently? "Pythonalization" in recent years, the Nigerian Islamic army has left their statutory duty and masquerade as the solution to the innumerable problems that besiege Nigeria. 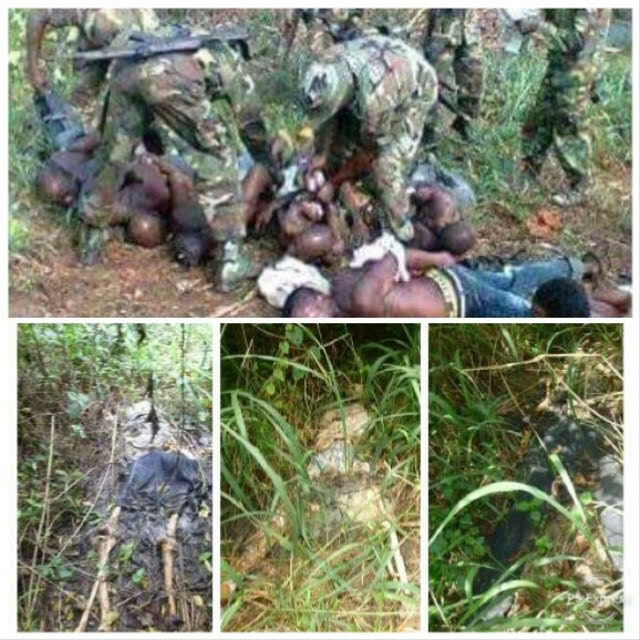 The Nigerian military is terrorizing and killing innocent indigenous people of Biafra. Information sourced from army headquarters said they were instructed to kill at sight with the code name “operation python dance”. The Islamic northerners in government see the affairs of all others subjectively, even when they go contrary to the interest of the subjects. In the realm of politics, the pernicious activities of the army and dictatorial government of Buhari continues to wrath a wreckage in Biafraland, for example more than twenty-eight Biafran youths lost their lives as a result of operation python dance 2 at the home of the leader of the indigenous people of Biafra, Mazi Nnamdi Kanu in Afaraukwu, Ibeku in Umuahia, Abia state. Hundreds more were killed during that demonic operation with many of the dead bodies deposited in mass graves. One may rightly ask the question of the role of the Nigerian army in the internal affairs of the country. This question is not baseless as the military more often than not acquiesces to the dictatorial regime. The Nigerian army is now being used in internal affairs like crowd control, protest control and conduct of elections and other sundry internal civil affairs thereby rendering the police redundant. Their part in election monitor is just to rig elections for the incumbent at the centre. A good example is the recently concluded Ekiti and Osun states governorship elections. This civil policing job has seriously weakened the army hence they can’t perform their duty of warding off external aggression as can be seen on how they are being decimated by Boko Haram. One can also see a pattern here in peaceful Biafraland, once an election is around the corner, they will start their murderous operation Python Dance” to intimidate and kill Biafrans. In preparation for the November 2018 Anambra guber elections, they launched their Python Dance II in September, where they abducted, maimed and killed Biafrans in thousands. Approaching another election, the Nigerian government has plotted the assassination and abduction of IPOB principal officers. Meanwhile many have been kidnapped by the Nigerian military in the name of operation python dance 3. It should be on record that those soldiers that masterminded and carried out the armed invasion of the home of the leader of the Indigenous People of Biafra, Mazi Nnamdi Kanu are yet to be identified, apprehended and arraigned before the court, neither has any soldier involved in the countless mass murder of Biafrans. Nigerian army does things without regard to due process. Elections have been rigged in full glare of everybody. The Ekiti state election was one of such. The government in power mobilized the whole battalion of soldiers to suppress the will of people. In fact, elections in Nigeria are fraudulent in principle. The above points are justified reasons why elections in Biafra land should be boycotted in other to facilitate the restoration of Biafra, which will allow the people to determine their economic and developmental pace as enshrined in United Nations charter on self-determination. I urge all Biafrans to boycott the upcoming elections to press home their demand for the restoration of the sovereign Jewish state of Biafra as directed by the leader of Indigenous People Of Biafra, Mazi Nnamdi Kanu. Biafra restoration is our last hope.